Leishmaniasis is a parasitic disease caused by a protozoan called “Leishmania sp.” and it is transmitted by “sandfly.” It is an endemic disease in the tropical and subtropical regions of South America, Southern Europe, as well as Eastern India., Leishmaniasis is categorized under several manifestations – visceral, cutaneous, and mucosal. The parasite affects the macrophages of mononuclear phagocyte system and increased incidence seen in malnutrition, immunosuppression, and HIV infection., Leishmaniasis is an emerging opportunistic coinfection in HIV-positive patients in endemic areas. Diagnosis of the cases often delayed due to lack of awareness and uncommon presentation. 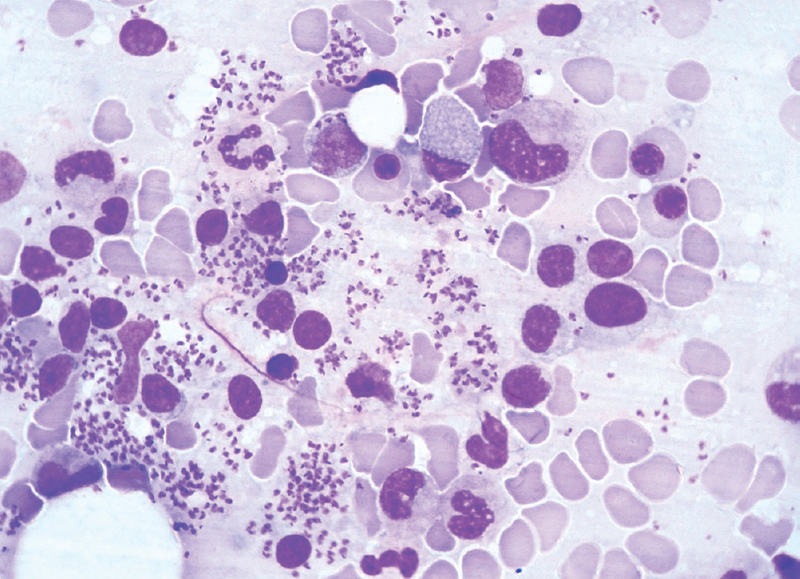 Demonstration of Leishman–Donovan (LD) bodies in lymph node by fine-needle aspiration cytology (FNAC) has rarely been reported in visceral leishmaniasis. We describe a rare case of cytology of leishmanial lymphadenitis involving epitrochlear lymph node in a case of HIV-reactive visceral leishmaniasis. A 38-year-old male patient presented to the Medicine Department with a history of low-grade fever, weight loss, and anorexia for the past 6 weeks. General examination revealed mild pallor, splenomegaly, and mild hepatomegaly with discrete enlarged lymph nodes at the right epitrochlear area and right cervical region. He was advised for all necessary investigations including FNAC of the lymph nodes. All biochemical tests were within normal limits, except mild elevation of liver enzymes (serum glutamic pyruvic transaminase – 60 IU/L, serum glutamic oxaloacetic transaminase – 53 IU/L, lactic dehydrogenase – 370 IU/L). On hematological examination, he had a hemoglobin level of 10.2 g% and erythrocyte sedimentation rate (ESR) was elevated (ESR – 68 mm/h). On serology screening, he was reactive to HIV I.
FNAC was performed from both cervical and epitrochlear lymph nodes with a 24G needle attached with 20 cc syringe. The smears were stained with Leishman–Giemsa stain and Ziehl–Neelsen stain. The smears showed polymorphous cell population, comprised of reactive lymphoid cells, histiocytes, isolated epithelioid cells, many tangible body macrophages, and macrophages filled with leishmania amastigote form [Figure 1] and [Figure 2]. Subsequently, he had undergone bone marrow examination and the smears revealed high parasitic load of amastigote form of leishmania in the bone marrow smears (parasite load – [5+]). The diagnosis was established as visceral leishmaniasis with leishmanial lymphadenitis with HIV-reactive status. He was treated with stibogluconate for 28 days with antiretroviral therapy. 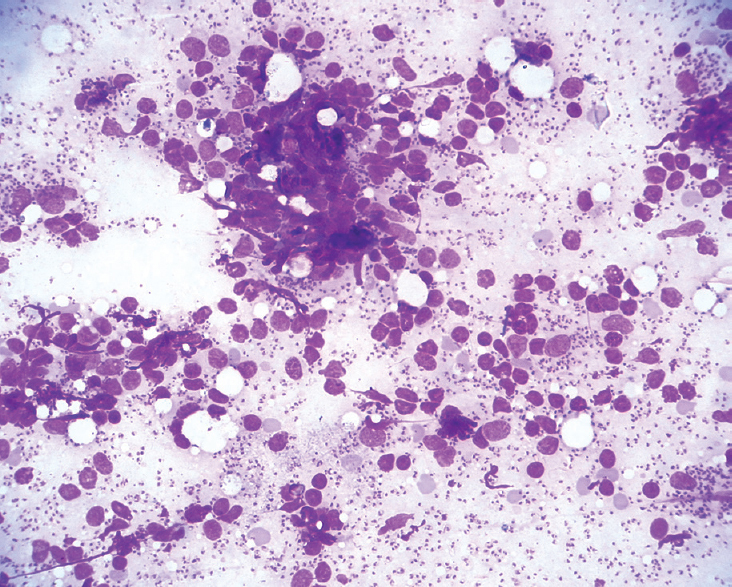 Sometimes, other infectious agents such as Toxoplasma, Histoplasma, Paracoccidioides, and Cryptococcus may be morphologically misinterpreted as LD bodies in lymph node aspirates.,, These differential diagnoses are important in cytological evaluation of lymph node aspirates in HIV patients. Prognosis of leishmanial coinfection with HIV patients is poor (average survival reduced) than other HIV patients. Sodium stibogluconate is the first-line therapy. Amphotericin B has been found to be more effective and less toxic than others in the treatment of visceral leishmaniasis with immunosuppression. Leishmaniasis is a rare cause of lymphadenopathy but should be considered as a differential diagnosis, particularly in endemic region. Visceral leishmaniasis may be a secondary cause of lymphadenopathy and pyrexia of unknown origin in HIV patients. Cytology diagnosis is an excellent tool for the management of leishmanial lymphadenitis. Beljan R, Sundov D, Luksić B, Soljić V, Burazer MP. Diagnosis of visceral leishmaniasis by fine needle aspiration cytology of an isolated cervical lymph node: Case report. Coll Antropol 2010;34:237-9. Yaduvanshi A, Jain M, Jain SK, Jain S, Arora S. Visceral leishmaniasis masquerading as tuberculosis in a patient with AIDS. Postgrad Med J 1999;75:732-4. Reus M, García B, Vázquez V, Morales D, Fuster M, Sola J, et al. Visceral leishmaniasis: Diagnosis by ultrasound-guided fine needle aspiration of an axillary node. Br J Radiol 2005;78:158-60. Bode AN, Poflee SV, Pande NP, Umap PS. Leishmaniasis in a patient with HIV co-infection: Diagnosis on fine needle aspiration cytology. Indian J Pathol Microbiol 2015;58:563-5. Sah SP, Prasad R, Raj GA. Fine needle aspiration of lymphadenopathy in visceral leishmaniasis. Acta Cytol 2005;49:286-90.
de Faria FB, Barroca H. Fine needle aspiration of a lymph node in an HIV patient with chronic infection by leishmania: A case report. Acta Cytol 2010;54:946-8. Kumar PV, Moosavi A, Karimi M, Safaei A, Noorani H, Abdollahi B, et al. Subclassification of localized leishmania lymphadenitis in fine needle aspiration smears. Acta Cytol 2001;45:547-54. Kumar B, Verma P. Role of fine-needle aspiration cytology in the prompt diagnosis of recurrence of visceral leishmaniasis presented as isolated cervical leishmanial lymphadenopathy. Diagn Cytopathol 2013;41:150-2.